The indefinite, constant, continued progress of existence. 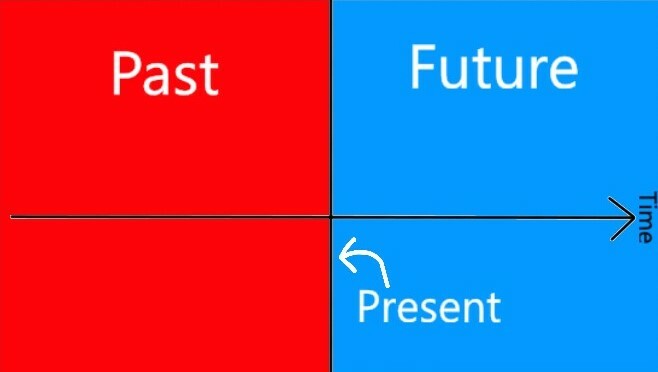 Now we have the three parts of time: The past, present and the future. And lets also say that the past of fixed and the future isn't. Existing or occurring now or at this point in time. My problem here is the word 'now'. If time is ever continuing and constant, then 'now' surely doesn't exist. The particular point will be infinitely small and if we are constantly moving into the future, then the present will be part of the past. So is there just a past and a present? Can it be that there is no such time as the present? Forget all loopholes, wormholes and other time-related problems for this. the present is actuality (everything perceivable). memory is an imprint of the past (a sound recording, a video, or an archeological artifact are always in the present, otherwise one could not experience them). the future is an imagination of what could be (or will be). Both memory and the imagination of the future (their form, not their content) are actual; they can be experienced, because they are in the present. The perception of the past and the future occurs in the present. Conclusion: the only actuality there is, is the present. The concept of past comes from experiencing a recording of motions, and the concept of future from an imagination of motions. 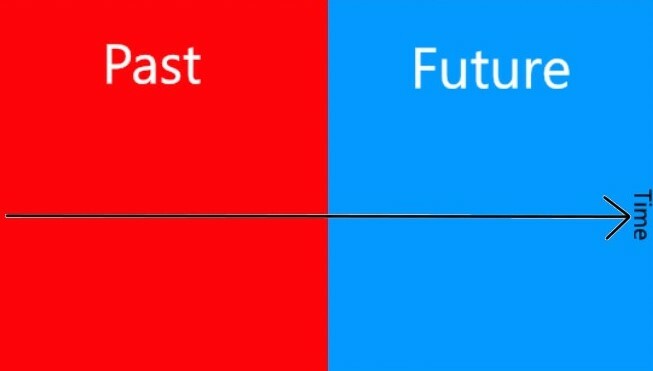 Both past and future are abstractions (ideas). I too, contemplate the marvel of the 'present' and conclude there is no such thing by the following analogy. The past is infinite in time and the future will be of infinite time also. If time was a rail way line, the present is where the two endless rails meet, pressed hard against each other (ignore the fact they are welded together for this analogy). The joint or gap, and there is no gap because they abutt tightly, is what we could call the present.... where the past meets the future. As there is no gap, there is also no present. As we cannot return to the past or step into the future, this gap or lack of it, the 'glorious present', is really a state of the human minds creation. We can however enjoy the sense of 'present' albeit for several seconds or minutes as where the past meets the future, and "be in the now' because human imagination can expand the zone of time longer than the gap itself. That's just the wonderful ability that the human mind has due to its sheer will and imaginative abstractions, but is not to say the 'present' in the railway line, has a space between its join in my hypothetical example, it doesn't. In the popular book 'The Power of Now' this expanded abstraction of time is what the book is based on i feel, as the gap itself "Now" between past and future, is practically zero in dimension and time lapse and therefore, such vast power owed to this perceived entity, the now, is an alluring fiction. This is a rather tricky question to answer, there is always a different view point. Present is best described by experience (though this is also slightly tricky). You cannot experience the past or the future, only the present. Of course light, sound and other experiences take time to reach you so any event takes time to reach you. So once you experience it the event is in the past...right? General relativity agrees that you experience something which originates from an event in the past. However what I would argue you experience is the light of that distant star hitting your eyes. The moment it hits your eyes is the present, that is your experience. The idea of the star, your inferred information about that star etc are all secondary to the actual photons. The line of the present is thin*, yes, but it is where we live so we cannot discount it's existence or you wouldn't be able to distinguish past from future. *The thinness perhaps defined by your reaction time (like the shutter speed of a camera). Other answerers have already pointed this out. It appears that all that we experience is present. My added value though is that thinking of present in mathematical terms is wrong. Existence is inherently extended and indivisible. So just as there are no truly atomic particles there are not time slices, gaps or vacuums in existence. I subscribe to the Muslim neoplatonic philosophers' view that from pure simplicity of the superior principles of cosmos, multiplicity and divisions in lower realms of existence arise. Human mind due to its nature can descend in the hierarchy of existence to witness division and multiplicity but can also move higher along the hierarchy via philosophical contemplation only to see all the divisions and components witnessed in lower levels fade away in unity of the superior planes of existence. Time is a good example, we ordinarily think of it as divided into past, present and future, yet upon contemplation we realize that there's no past and future, but only "present" and even furthermore all the sense of past and future depend on our present, as past in some sense always accompanies us in present as does future. More surprisingly then we realize that the moment we think of present we lose it hence the contemplation can't help but to take us to probably the supreme understanding that only Martin Heidegger -- and Mulla Sadra to credit this not-yet recognized genius of my heritage -- appear to have realized: Being, as only Being can truly be above all categories including present, and while being indivisible, inexhaustible, ineffable yet be the source of all that is divisible, exhaustible, and describable! Therefore when we're trying to capture the present, we are actually aiming at Being, but this would always be a missed aim as Being despite being the principle of everything remains always inaccessible! I was thinking the same thing "is there actually a present time," and this has come about in respect to some Christian views on open theism as the past is no longer active and the future is unknown by God. However, how do we measure time in respect to history, the present and the future? History we can measure because it has happened. As for the present, what does it consist of? One millionth of a second and it is history. As for the future, it is progressive for as long as we are in it, but just as the present becomes history, so does the future. I'd place my bet on b). Here's why. I think we can agree that it is impossible for us to experience any "real" present since, technically, that would be experiencing an infinitely small point in time. Yet here we are, moving through time and space, from past to future, yet always only ever experiencing the present (we don’t experience what we call the past, we only remember it in the present – we don’t experience what we call the future, we only visualize it in the present). Therefore, the present is all there is, because that is where we only ever exist, and would therefore have to include, in that present, what we conceive as the past and the future. The passage of time could be merely an illusion, as we experience various events along the entropic forward arrow of time. A couple of crude analogies could be a map, or a road. Time could be likened to a map – a thing – with past present and future all contained therein, as opposed to a flow. As we move along in life, we're merely projecting ourselves onto different points of the map. The point on the map where we were before still exists right before our eyes, the same as it did before; just as the point on the map where we’ll be next week exists, presently, right before our eyes, even though that event is still in the future. Time could be likened to a road we’re travelling on. The road exists, in its entirety, right now, from beginning to end. But the point we’re currently occupying is not the reality of the road; the entire road is the reality of the road. The segment of the road already traversed may be behind you (in the past), but it’s just as real as it ever was. Same with the road ahead – still in the future, but as much real as it ever was, or will be. The entire road is present, regardless of where you are on it. To summarize, since we do exist (my personal opinion) and since there is no such thing a ‘present moment’ then there can only be an all encompassing ‘now’. Emphasis mine. You don't seem to have dervied the claim from anythig specific, but maybe time must be composed of infintely small instants, else e.g. we can't easily model it geometrically. Perhaps the gist of it is that if the present (today) is infintely divisible there must be an instant which is most now. In the similar way to how every past event has an instant it has ended, and the future has a time it must begin, the present must have both. And these are the same time. At least supposing that when we divide up the present duration we mark something that is before or after: and what is before a present event is in the past. But, unfortunately, that's just question begging. Cleatly some people deny the reality of the present, as some reject the idea of tense altogether. And maybe even it's true that the present is an infinitely small instant. I see no pressing need to accept either from your question, and would I think humbly suggest that our mathematical models and expressions are robust enough to handle infinitesimals. An important thing to consider is that everything you have conceptualized relies on time being continuous rather than discrete. Because it is not necessarily the case that time is continuous (I.E. it may be discrete), it is not necessarily the case that the "now" moment encompasses 0 units of time. There is no inherent reason why there can't be a sort of granular/discrete nature to time like there is with matter (which is composed of discrete atoms). As an analogy think of water. It certainly doesn't look discrete, but actually it is composed of typically imperceptible atoms. If you had a bucket of water, slowly poured it out, and defined a plane over the top of the bucket such that all water to the left of the plane was considered in the bucket and all water to the right of the plane was considered out of the bucket, you might think, if you thought that water was not in any sense discrete in nature, that all water must be inside or outside the bucket because the thickness of the plane is 0. But actually water is composed of discrete atoms that of non-zero volume in 3D space, and so any atom of water sliced by that plain is neither inside nor outside the bucket (at least not totally). If water in the bucket is present time and water out of the bucket is past time the water atoms sliced by the plane are now time. We have no reason to believe that time is discrete, but we have no reason to believe that it is continuous either except that we perceive it as continuous in the same way that we normally perceive water to be continuous. I think your question gets at something very interesting. If the present is an infinitely narrow interface between the past and the present, how does anything happen at all? You can look at resolutions of Zeno's Paradox for some methodological answers, and energy and momentum derive from them which are invariant through time. I wrote a quick summary of some views from modern physics on time and causality in Is it possible for something to have no cause? This talk was good too, on doing physics with time as emergent rather than fundamental https://youtu.be/1ogiQ2E6n0U (it's pitched at the non specialist). Something like, there are no things only sets of possibilities and echanges, which we call events. There are different functional roles for the meaning of present. The physics one, which is limited by the speed of light, with things getting closer in time-connection with closeness in space. There is a psycological present for humans too, to do with our ability to take in perceptions and react. We might analogise back, to say that speed of interactiin can be imagined as the finite extension of 'now', in physics for light to bounce out and back, like in psycology for perception and reaction. A hummingbird has a different sense of the present to a human, and a cosmic ray particle a speed of change much closer to the fundamental light-speed limit, than the practical speed of change of say an atom of frozen helium. The mistaken assumption you're making is that the present moment is infinitely small. It's not. This is the same reason why the mathematical notion of the continuum fails to capture the notion of the physical continuum. It's a lot more complex than that. But whereas it's easy (!) to experiment on atoms, it's very much more difficult to experiment on atoms of time. The Planck time is well out of reach of present technology. Not the answer you're looking for? Browse other questions tagged time or ask your own question. Is there a point in universe that is observable at present? How does time flow in presentism? What analogies are there for thinking about the flow of time?